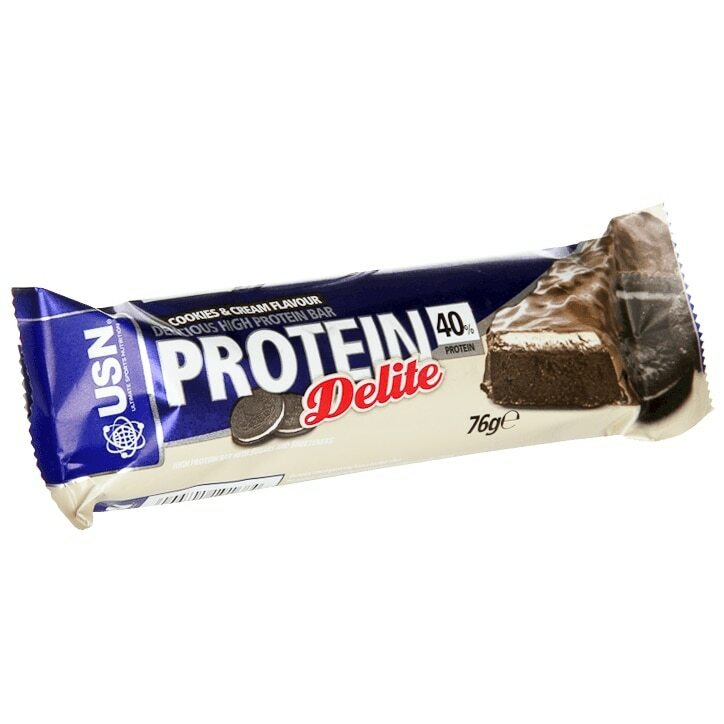 USN Protein Delite Cookies and Cream a delicious candy bar taste, USN’s newest protein bars contain up to 30g of high quality protein (based on a 76g bar), 0g Trans Fat and Whey Isolate. Delight the taste buds with nutty Toffee Almond or smooth Cookies & Cream Flavours. Chocolate Coating [Sugar, Palm Kernal Oil, Whey Protein Concentrate (Milk) , Cocoa Powder, Emulsifier (Soy Lecithin), Vanillin], Protein Blend (Whey Protein Isolate (Milk), Milk Protein Isolate, Whey Protein Concentrate (Milk), Soy Protein Isolate), Cream Layer [Frappe( Maltidol Syrup Egg Albumen, Water, Vanilla, Invertase), Hydrolyzed Gelatin, Coconut Oil, Emulsifier (Lecithin)], Soy Protein Crisps (Isolated Soy Protein, Cocoa Powder, Tapioca Starch, Sodium Chloride), Glycercine, Water, Hydrolyzed Gelatin, Peanut Paste, Coconut Oil, Cocoa Powder, Flavour, Emulsifier (Lecithin), Sodium Chloride, Preservative (Potassium Sorbate). Allergen information: Contains peanuts, soy, wheat, egg and milk. Manufactured in a facility that also processes tree nuts.